A short visit in Ocotober 2013 gave the opportunity to get some public transport impressions of Kosovo. Recent history had its impact on the bus system. Virtually all buses are secondhand from Germany, Austria, Switzerland, France and Italy dating from the 1990’s with some Turkish and other buses mixed in. 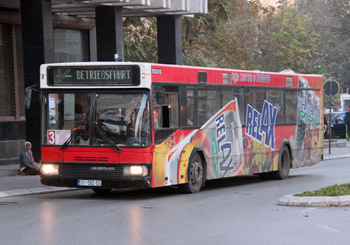 Operations are private, also on Pristina city services. There is no company livery, buses used are used in their old colours or have overall adverstisements.